You might say there’s a unified theory of Hanks: The actor contains multitudes, but is always Tom Hanks. As a result, he’s often accused of playing one character: the fundamentally decent, good-hearted, noble but humble all-American everyman. There’s some truth to this, of course — Hanks wouldn’t work as Travis Bickle, no matter how hard he tried. But it’s not fair to paint Hanks as playing the same character over and over, and it certainly wouldn’t be fair to say that he doesn’t challenge himself or take chances. Hanks has transformed himself from the party-dude of Bachelor Party to the romantic lead of Sleepless in Seattle to the war hero of Saving Private Ryan to the six different characters he plays, amusingly, in Cloud Atlas. The guy might only play a certain number of notes, but he always manages to make them sound unique. 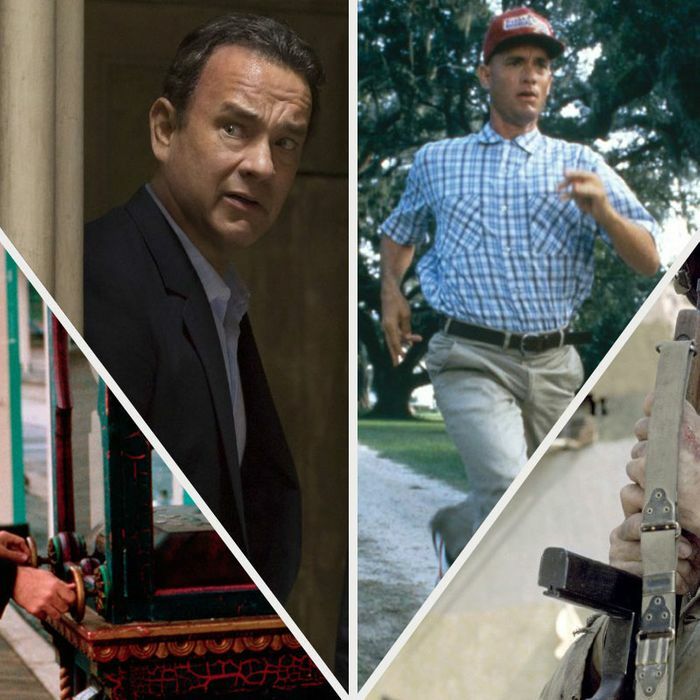 We’ve also indicated in parentheses where each title falls in our overall rank of Tom Hanks movies, in case you’re simply looking for the best of the best. A note: We limited our guide to live-action movies only, meaning Hanks’s superb turns in the three Toy Story films aren’t on the list. It goes without saying that there’s never a bad time to watch a Toy Story movie. Hanks broke out as a comedic leading man straight from the sitcom world, and it’s worth noting that the Tom Hanks Character, in the ‘80s, was much more elastic and clownish than the one we see today. But even during that period, you could see him evolving. The Hanks your mom loves. The Hanks that will line the shelves of Walmart well past a nuclear holocaust. Hanks is a more ambitious actor than he might appear: He’s aware you think he’s playing the same character every time out, and knows sometimes he has to surprise us. When you’re the biggest movie star in the world, as Hanks was for a few years, you just get cast as the lead in movies just because you’re the biggest movie star in the world. Sometimes it’s a fit. Sometimes, less so. Sometimes, Hanks just wants to hang out with his kids and friends. Hey, guys, let’s put on a movie! Hanks is often clothed as a sort of stand-in for the American character, a suit that’s so impossible to fill out that it’s pretty amazing how well it fits him. Hanks has a prankster quality that’s a little underrated: Sometimes, he’ll just decide, “I’m doing one gag for a whole movie.” And generally he pulls it off. *This article originally misidentified instances of Tom Hanks’s Academy Awards nominations. We regret the error.